SRK UK has been a key component in many large scale development projects in the London region. Utilising our expertise in architectural specification and our experience in product sourcing, we have supported these projects from initial design through to final construction. This is an example of some of the numerous projects we have contributed to recently. Located in the heart of bustling Camden, North London, Prince’s Park is a luxury development that stands seven stories high. SRK provided a range of products to this exceptional project, which contains a multitude of outstanding one, two and three bedroom apartments. Inspired by the art school Bauhaus, Prince’s Park boasts a striking ship-like design which really makes it stand out from the surrounding architecture. This luxurious development is ideally situated between Camden, Hampstead, Kentish Town and Primrose Hill, and contains a new medical centre housing the Prince of Wales Road GP surgery which serves the local community. The development contains 36 private apartments and 19 affordable homes. The top floor terraces provide stunning views of the green foliage provided by the adjacent Tulare Gardens. SRK UK provided products and consultation on this Sidworth Street development in London Fields, East London. Influenced by the loft and warehouse style living in New York during the 1930’s, this stunning development contains a lift manufactured with steel and brass; giving the building a completely unique flavour from the rest of the area. One of the exceptional features of this project is the heated glass bottomed swimming pool which doubles as the roof for the apartment block. A 24 hour concierge will be available for residents; as well as access to outside space. The one, two and three bedroom apartments will contain smart house capabilities as well as heated walls and extra high ceilings. All residents will have access to a communal central atrium. One58, Prince of Wales Road, contains 9 spacious apartments spread over 6 stories. This opulent development comes with under floor heating in all its units, as well as Bosch appliances contained within Poggenpohl Kitchens. Extremely close to Chalk Farm underground station, One58 provides great access to the City of London and central London terminals. This development has been constructed with help from SRK, under the remit that the apartments appeal to a wide range of buyers. Units should appeal to young professionals; buy to let investors and families with children. Luxurious timber decked balconies give unparalleled views of the capital. The high specification apartments on offer span from one and two bedrooms to a three bedroom penthouse; giving a vast array of potential buyers a chance to experience the ultimate in modern city living. Arthaus encompasses 45 apartments of one, two or three bedrooms and 3 town houses; as well as providing quality spaces for media professionals, designers and artists. 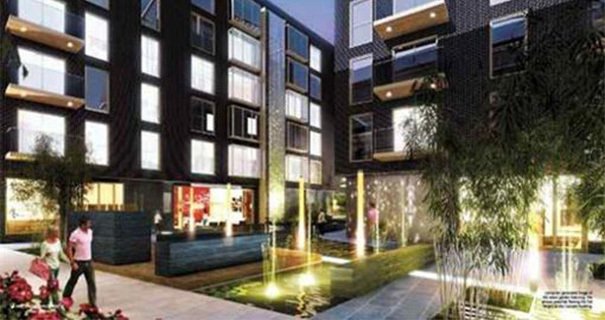 This exciting East London development is situated in the new, youthful and vibrant area of the city; London Fields. Previously housing an art gallery, it still contains the headquarters of Momart – Britain’s foremost art storage experts. The full height atrium contains a cafe in the style of a traditional hotel lobby, giving a sense of style and history to this artistic building whilst also providing a great meeting point for workers and residents. Apartments can be accessed from balconies which are located around the centre of this stunning building. Incredible views across the city can be enjoyed from the communal roof terrace. First constructed in the 1930’s, being used as a dancehall and theatre house, SRK are proud to have worked on a building which is steeped in so much local history; now giving this fantastic building a new modern twist. This beautiful new development is situated in the thriving area of Bermondsey Spa. SRK UK consulted and provided materials for the porcelain black tiles, polished quartz and black granite worktops that are fitted within the kitchens of these luxury apartments. Bosch appliances and high end Villeroy and Boch fittings are the icing on the cake of the stunningly designed kitchen areas. The eye-catching development contains a waterfall which flows down the entire length of the building; which has been designed in the style of ‘Japanese Water Gardens’. The apartments offer a degree of seclusion from the rigours of modern life which is unmatched within the city of London. The highly-specified apartments are serviced by a concierge in addition to having a communal entertainment room, on site restaurant and cafe and a luxurious private wine cellar. Cold storage lockers allow residents to receive deliveries of food and drink whilst they are away from home and be assured that they will be fresh when they arrive back. A fully landscaped green area is available to residents year round. Located just minutes away from Greenwich town centre, Theatro is a stunning, state of the art development. 48 carefully specified one, two and three bedroom apartments make up this gorgeous building; which contains an aquarium in the lobby for a special, unique touch. SRK UK provided state of the art building materials for this project which has been designed to the specifications of the top end of the market. The ground floor contains a variety of bars, restaurants and studio spaces whilst the first four floors contain an exciting intermingling of workshops, artist studios, offices and residential areas. A private terrace is available for all residents to relax and unwind in the peace and quiet of a secluded area.